You know when people ask you what camp you sit in: cake or frosting? Growing up, I had always considered myself a cake girl. I had always been the girl who scraped 90% of the frosting off cakes before eating. Turns out it was because I had only ever eaten grocery store cakes where the frosting was overly sweet, made with powdered sugar, butter, way too much food coloring...and nothing else. Now that I'm older and know what good frosting tastes like, my answer would be "neither." I sit in neither camp. Because one without the other is incomplete. One without the other is nothing by itself. I've been on the lookout for the perfect chocolate frosting. 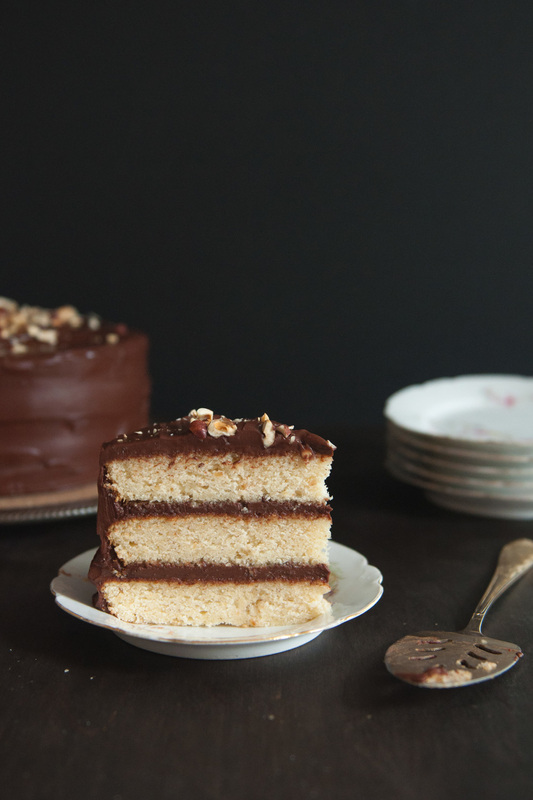 Regular American buttercream is way too sweet and grainy. Swiss/Italian buttercream is absolutely lovely for vanilla, but it's a little too light for chocolate. Cream cheese? meh. Sour cream, now there we go. There we have it. The best little bakery in Chicago has this chocolate cupcake. I love every part of it, but especially the frosting. After a few trips, I finally asked the bakery lady what the frosting is made out of and to my surprise, she said sour cream! It had never occurred to me to use sour cream as a component in chocolate frosting, but in hindsight, it's genius. The tanginess offers a great contrast the the sweet and slightly bitter flavors of chocolate. A few months ago, I tried making a sour cream frosting and it turned out wayyyyy too thick. Almost unspreadable. Sad :(. I didn't have any occasions coming up for which to make more layer cakes, so the perfect-sour-cream-frosting-project sat gathering dust for a while. Recently, I resumed my quest (just 'cause! ), and now I have something that I'm proud to share with all of you. Makes 1 three layer, 8 inch cake. Serves 12 to 16. Preheat oven to 350 degrees F. Butter three 8 inch cake pans, place parchment paper rounds in each pan and butter those as well. 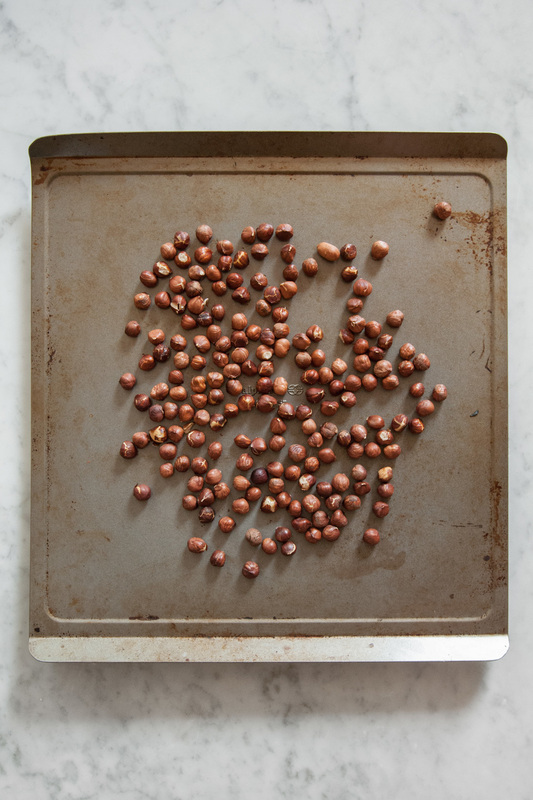 Place hazelnuts in one layer on a baking sheet. Bake for 6 to 8 minutes until fragrant. Let cool and skin the hazelnuts. It's okay if some of the skin won't come off. Set aside about 1/3 cup of hazelnuts for garnish (here I pick out the nuts that have the most skin still stuck on, since it looks nice for garnish, and leave the most cleanly skinned ones for going inside the cake). 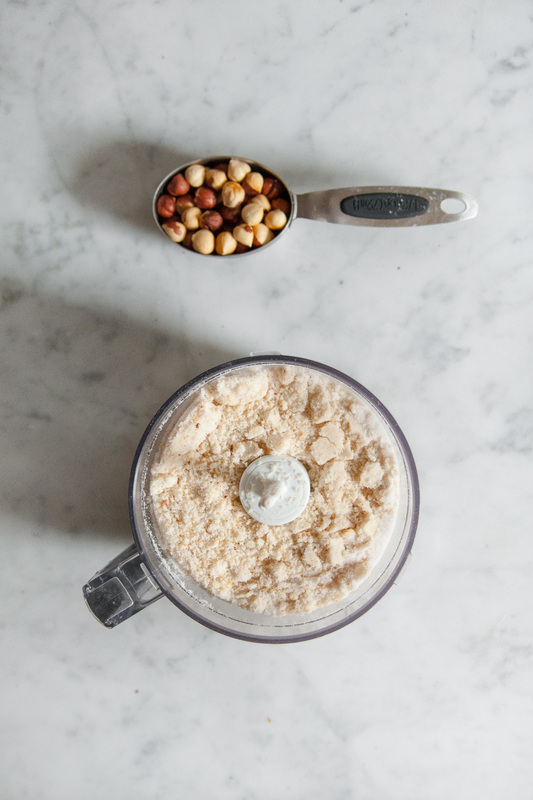 Transfer the other 2/3 cup of hazelnuts to a food processor. Add sugar and pulse until hazelnuts are finely ground. Transfer mixture to the bowl of a stand mixer. Add cake flour, baking powder, and salt. With the paddle attachment, beat on low for 20 seconds until well combined. Add butter, milk, and vanilla. Beat on low for 30 seconds until combined, then turn the speed up to medium and beat for 2 to 3 minutes until light and fluffy. Add eggs in two additions, beat for only a few seconds until just incorporated, scraping down the bowl each time. The batter will be quite thick, so don't fret if it doesn't look like you anticipated! Divide batter evenly between the three cake pans. Bake for 20 to 25 minutes until a toothpick (or as I used, a dried spaghetti noodle) inserted comes out clean. Let sit until cool enough to handle, 10 to 15 minutes. Gently transfer the cakes to a wire rack, cover with plastic wrap, and let sit until cooled. If you are not planning on frosting the same day, tightly wrap each layer in plastic wrap and place in freezer. In a small saucepan, bring an inch or two of water to a gentle simmer over medium-low heat. Place chocolate in a medium mixing bowl that is wide and shallow enough to sit over the saucepan without touching the water. Melt the chocolate until completely smooth. Remove from heat. In another medium mixing bowl, add corn syrup, sour cream, vanilla, and salt. Place over the same saucepan of simmering water. Heat up the sour cream mixture until warm and liquid-y. 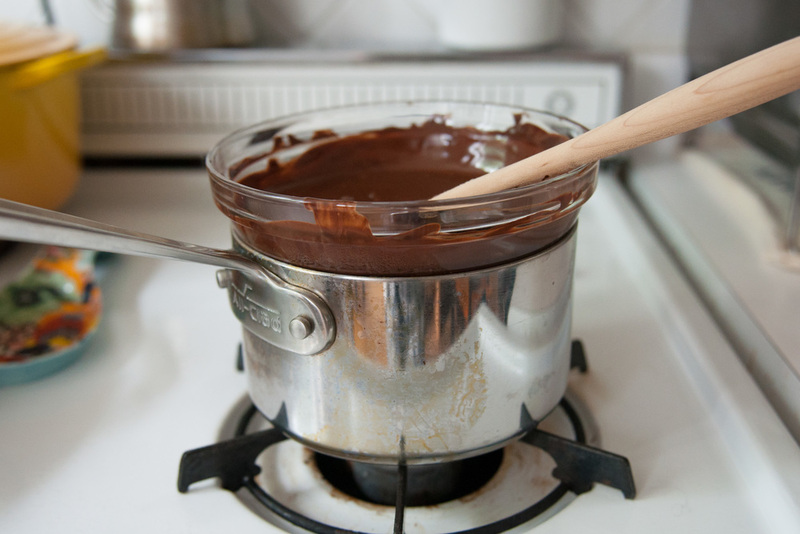 Add sour cream to chocolate and mix with a spatula until no streaks remain. Whisk together butter and powdered sugar until well incorporated. Add to the chocolate/sour cream mixture and continue mixing with a spatula until completely smooth and homogeneous. Chill in fridge for 30 minutes to 1 hour or until the frosting is a spreadable consistency. Trim the tops of each cake layer if necessary (this particular cake doesn't puff up too much in the middle, so you don't have to if you don't feel like it). 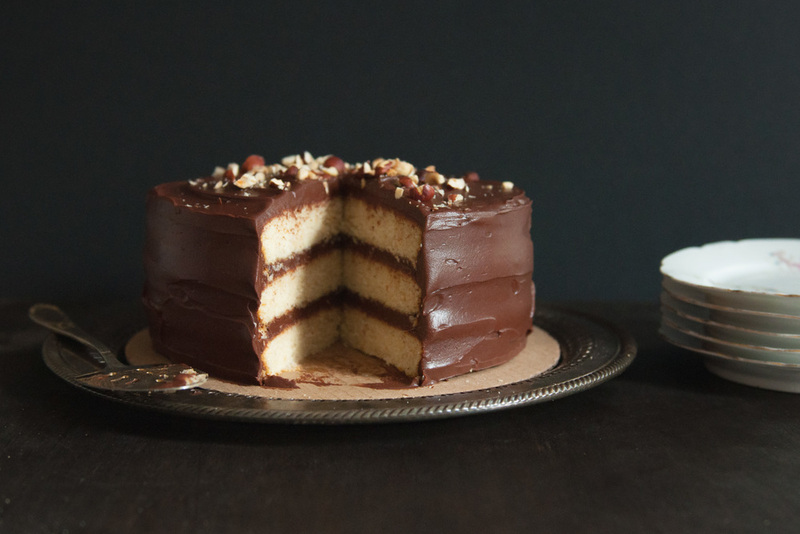 Place the first layer, top down, on a cake stand or plate. Place a quarter of the frosting on top and spread it out evenly. 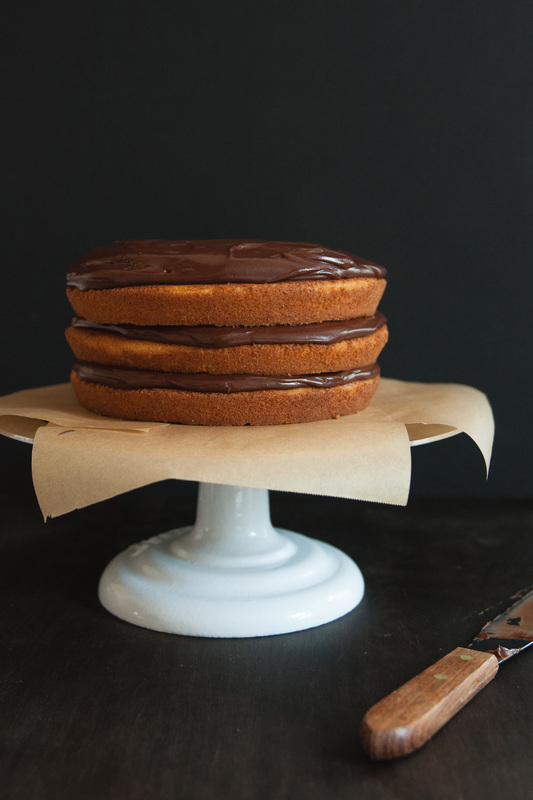 Repeat with the second layer, frosting, and third layer. Spread remaining frosting all over the cake. Roughly chop the reserved hazelnuts and use as garnish. Slice and enjoy!